It's without a doubt that Facebook is a monster when it comes to the number of users that they have worldwide, with estimated figures of around 1.5 billion. This makes it easily the most widely used social networking site in the world. With such success and popularity that Facebook has, comes the inevitable attention from hackers and with that, makes them a massive target for these cyber thieves. Thousands of accounts get hacked every day and in some cases cause the user a whole lot of problems as usually personal data is stolen and used against them. 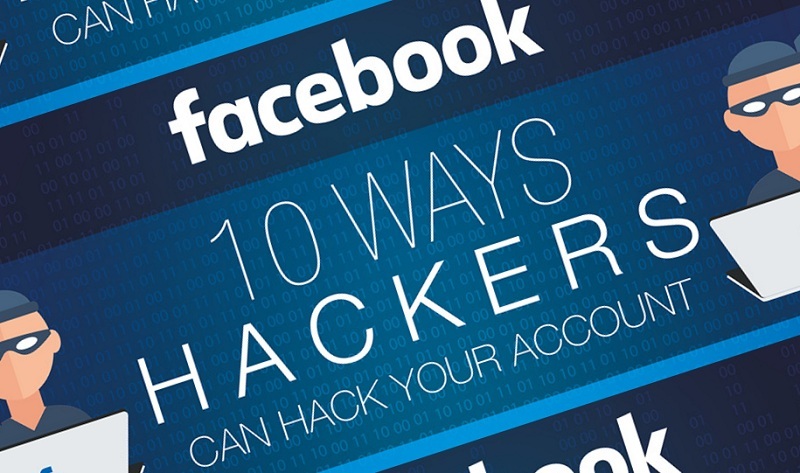 The infographic below by the guys over at TopTenSelect illustrates the top 10 ways that hackers use to get into your Facebook accounts and cause absolute havoc! The graphic also shows you just how you can combat these low life crooks by making your accounts extra secure. You can find all this valuable information at the bottom of the graphic under the section ““Ways To Protect Your Facebook Account From Hackers”. Simple tips such as not saving passwords to your browser and increasing the character count of your password can make such a difference. Don’t become another victim to Facebook hacking. It’s vital you take action now, because if you don’t, you could just well be next.